Home > Safety Signs > Hazard Warning Signs > Biohazard Signs > Biohazard symbol and text safety label. 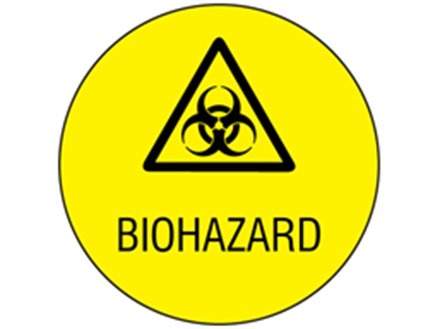 Biohazard symbol and text label. Part of our biological hazard warning safety range, to warn the workforce of dangers to health from contact with infectious materials. 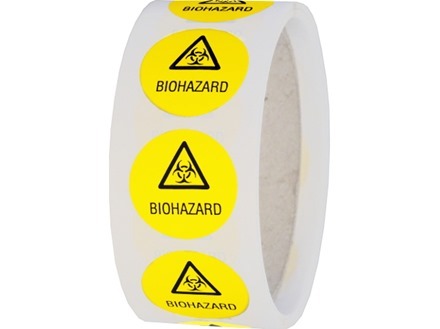 Laboratory hazard warning labels and tapes. Biohazard labels. Comply with ISO 7010 and Safety Signs and Signals Regulations 1996. Supplied in roll of 250 labels. BLL010 Size 30mm diameter. Material self adhesive vinyl.